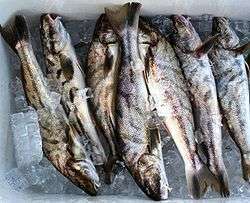 Foodborne illness can also be caused by pesticides or medicines in food and naturally toxic substances such as poisonous mushrooms or reef fish. Techniques that help prevent food borne illness in the kitchen are hand washing, rinsing produce, preventing cross-contamination, proper storage, and maintaining cooking temperatures. In general, freezing or refrigerating prevents virtually all bacteria from growing, and heating food sufficiently kills parasites, viruses, and most bacteria. Bacteria grow most rapidly at the range of temperatures between 40 °F and 140 °F, called the "danger zone". Storing food below or above the "danger zone" can effectively limit the production of toxins. 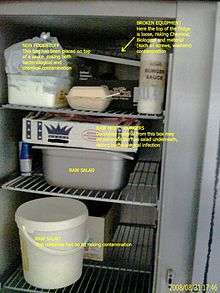 For storing leftovers, the food must be put in shallow containers for quick cooling and must be refrigerated within two hours. When food is reheated, it must reach an internal temperature of 165 °F (74 °C) or until hot or steaming to kill bacteria. Aflatoxins – originated from Aspergillus parasiticus and Aspergillus flavus. They are frequently found in tree nuts, peanuts, maize, sorghum and other oilseeds, including corn and cottonseeds. The pronounced forms of Aflatoxins are those of B1, B2, G1, and G2, amongst which Aflatoxin B1 predominantly targets the liver, which will result in necrosis, cirrhosis, and carcinoma. In the US, the acceptable level of total aflatoxins in foods is less than 20 μg/kg, except for Aflatoxin M1 in milk, which should be less than 0.5 μg/kg. The official document can be found at FDA's website. Altertoxins – are those of Alternariol (AOH), Alternariol methyl ether (AME), Altenuene (ALT), Altertoxin-1 (ATX-1), Tenuazonic acid (TeA) and Radicinin (RAD), originated from Alternaria spp. Some of the toxins can be present in sorghum, ragi, wheat and tomatoes. Some research has shown that the toxins can be easily cross-contaminated between grain commodities, suggesting that manufacturing and storage of grain commodities is a critical practice. Trichothecenes – sourced from Cephalosporium, Fusarium, Myrothecium, Stachybotrys and Trichoderma. The toxins are usually found in molded maize, wheat, corn, peanuts and rice, or animal feed of hay and straw. Four trichothecenes, T-2 toxin, HT-2 toxin, diacetoxyscirpenol (DAS) and deoxynivalenol (DON) have been most commonly encountered by humans and animals. The consequences of oral intake of, or dermal exposure to, the toxins will result in Alimentary toxic aleukia, neutropenia, aplastic anemia, thrombocytopenia and/or skin irritation. In 1993, the FDA issued a document for the content limits of DON in food and animal feed at an advisory level. In 2003, US published a patent that is very promising for farmers to produce a trichothecene-resistant crop. In 1883, the Italian professor Salmi, of Bologna, introduced the generic name ptomaine (from Greek ptōma, "fall, fallen body, corpse") for alkaloids found in decaying animal and vegetable matter, especially (as reflected in their names) putrescine and cadaverine. The 1892 Merck's Bulletin stated, "We name such products of bacterial origin ptomaines; and the special alkaloid produced by the comma bacillus is variously named Cadaverine, Putrescine, etc." While The Lancet stated, "The chemical ferments produced in the system, the...ptomaines which may exercise so disastrous an influence." It is now known that the "disastrous...influence" is due to the direct action of bacteria and only slightly to the alkaloids. Thus, the use of the phrase "ptomaine poisoning" is now obsolete. The delay between consumption of a contaminated food and appearance of the first symptoms of illness is called the incubation period. This ranges from hours to days (and rarely months or even years, such as in the case of listeriosis or bovine spongiform encephalopathy), depending on the agent, and on how much was consumed. If symptoms occur within one to six hours after eating the food, it suggests that it is caused by a bacterial toxin or a chemical rather than live bacteria. Asymptomatic subclinical infection may help spread these diseases, particularly Staphylococcus aureus, Campylobacter, Salmonella, Shigella, V. cholerae, and Yersini. For example, as of 1984 it was estimated that in the United States, 200,000 people were asymptomatic carriers of Salmonella. 127,839 were hospitalized (43 per 100,000 inhabitants). 3,037 people died (1.0 per 100,000 inhabitants). This data pertains to reported medical cases of 23 specific pathogens, as opposed to total population estimates of all food-borne illness for the United States. Serious outbreaks of foodborne illness since the 1970s prompted key changes in UK food safety law. These included the death of 19 patients in the Stanley Royd Hospital outbreak and the bovine spongiform encephalopathy (BSE, mad cow disease) outbreak identified in the 1980s. The death of 17 people in the 1996 Wishaw outbreak of E. coli O157 was a precursor to the establishment of the Food Standards Agency which, according to Tony Blair in the 1998 white paper A Force for Change Cm 3830, "would be powerful, open and dedicated to the interests of consumers". 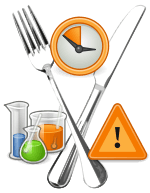 1 2 "Foodborne Illness - Frequently Asked Questions". US Centers for Disease Control and Prevention. Archived from the original on March 3, 2011. Retrieved 3 July 2016. ↑ "Reducing the risk from E. coli 0157 – controlling cross-contamination". Food Standards Agency, United Kingdom. February 2011. Retrieved 14 August 2016. ↑ "Staphylococcal Food Poisoning". U.S. Centers for Disease Control and Prevention. Retrieved 3 July 2016. 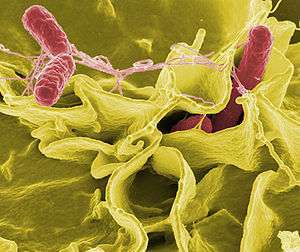 ↑ "Foodborne Illness: What Consumers Need to Know". USDA.gov. Retrieved 14 August 2016. ↑ Tribe, Ingrid G; Cowell, David; Cameron, Peter; Cameron, Scott (2002). "An outbreak of Salmonella Typhimurium phage type 135 infection linked to the consumption of raw shell eggs in an aged care facility". Communicable Diseases Intelligence. 26 (1): 38–9. PMID 11950200. Archived from the original on February 17, 2014. ↑ "Salmonella Infection (salmonellosis) and Animals". Centers for Disease Control and Prevention. Retrieved August 12, 2007. ↑ Doyle, M. P.; Erickson, M. C. (2006). "Reducing the carriage of foodborne pathogens in livestock and poultry". Poultry science. 85 (6): 960–73. doi:10.1093/ps/85.6.960. PMID 16776463. ↑ Food poisoning: Causes. Mayo Clinic. 1 2 Argudín M, Mendoza MC, Rodicio MR (2010). "Food poisoning and Staphylococcus aureus enterotoxins". Toxins (Basel). 2 (7): 1751–73. doi:10.3390/toxins2071751. PMC 3153270 . PMID 22069659. ↑ Staphylococcus aureus: A Problem When Food Is Left Out Too Long. Ohio State University Extension HYG-5564-11]. ↑ "FDA Says Viruses Safe for Treating Meat". Archived from the original on August 25, 2006. Retrieved September 2, 2014. ↑ DeRusha, Jason. "Good Question: Does Washing Fruit Do Anything?". Retrieved 2016-09-18. ↑ Mount, Michael. "Fungi and Mycotoxins" (PDF). vetmed.ucdavis.edu. Retrieved August 11, 2007. ↑ "Aflatoxins". Center for Food Safety & Applied Nutrition. Retrieved August 12, 2007. ↑ "GASGA Technical Leaflet – 3 Mycotoxins in Grain". Food and Agriculture Organization of the United Nations. Retrieved August 12, 2007. ↑ "Chapter 2 Foodborne Hazards in Basic Food Safety for Health Workers" (PDF). World Health Organization. Retrieved August 12, 2007. ↑ "Sec. 683.100 Action Levels for Aflatoxins in Animal Feeds (CPG 7126.33)". Food and Drug Administration. Retrieved August 13, 2007. ↑ Henry, Michael H. "Mycotoxins in Feeds: CVM's Perspective". FDA.gov. Retrieved January 1, 2012. ↑ Webley DJ, Jackson KL, Mullins JD, Hocking AD, Pitt JI (1997). "Alternaria toxins in weather-damaged wheat and sorghum in the 1995–1996 Australian harvest". Australian Journal of Agricultural Research. 48 (8): 1249–56. doi:10.1071/A97005. ↑ Li F, Yoshizawa T (2000). "Alternaria mycotoxins in weathered wheat from China". J. Agric. Food Chem. 48 (7): 2920–4. doi:10.1021/jf0000171. PMID 10898645. ↑ Motta SD, Valente Soares LM (2001). "Survey of Brazilian tomato products for alternariol, alternariol monomethyl ether, tenuazonic acid and cyclopiazonic acid". Food Addit Contam. 18 (7): 630–4. doi:10.1080/02652030117707. PMID 11469319. ↑ Li FQ, Toyazaki N, Yoshizawa T (2001). "Production of alternaria mycotoxins by Alternaria alternata isolated from weather-damaged wheat". J. Food Prot. 64 (4): 567–71. PMID 11307900. ↑ Marasas WF (1995). "Fumonisins: their implications for human and animal health". Nat. Toxins. 3 (4): 193–8; discussion 221. doi:10.1002/nt.2620030405. PMID 7582616. ↑ Soriano, J.M. (2004). "Occurrence of fumonisins in foods". Food Research International. 37 (10): 985–1000. doi:10.1016/j.foodres.2004.06.009. ↑ "CVM and Fumonisins". Food and Drug Administration. Archived from the original on August 12, 2007. Retrieved August 13, 2007. ↑ "More contaminated maize meal products withdrawn from sale". Food Standards Agency. Retrieved August 12, 2007. ↑ "20th Australian Total Diet Survey – Part B". Food Standards Australia New Zealand. Retrieved August 13, 2007. 1 2 "Worldwide regulations for mycotoxins in food and feed in 2003". FAO FOOD AND NUTRITION PAPER 81. Retrieved August 13, 2007. ↑ "Patulin in Apple Juice, Apple Juice Concentrates and Apple Juice Products". Food and Drug Administration. Retrieved August 16, 2007. ↑ Sabater-Vilar M, Nijmeijer S, Fink-Gremmels J (2003). "Genotoxicity assessment of five tremorgenic mycotoxins (fumitremorgen B, paxilline, penitrem A, verruculogen, and verrucosidin) produced by molds isolated from fermented meats". J. Food Prot. 66 (11): 2123–9. PMID 14627292. ↑ Adejumo TO, Hettwer U, Karlovsky P (May 2007). "Occurrence of Fusarium species and trichothecenes in Nigerian maize". Int. J. Food Microbiol. 116 (3): 350–7. 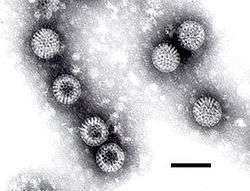 doi:10.1016/j.ijfoodmicro.2007.02.009. PMID 17412440. ↑ Mazur LJ, Kim J (2006). "Spectrum of noninfectious health effects from molds". Pediatrics. 118 (6): e1909–26. doi:10.1542/peds.2006-2829. PMID 17142508. ↑ Froquet R, Sibiril Y, Parent-Massin D (2001). "Trichothecene toxicity on human megakaryocyte progenitors (CFU-MK)". Hum Exp Toxicol. 20 (2): 84–9. doi:10.1191/096032701677428611. PMID 11327514. ↑ Joffe AZ, Yagen B (1977). "Comparative study of the yield of T-2 toxic produced by Fusarium poae, F. sporotrichioides and F. sporotrichioides var. tricinctum strains from different sources". Mycopathologia. 60 (2): 93–7. doi:10.1007/bf00490378. PMID 846559. ↑ Hay, R. J. (2007). "Fusarium infections of the skin". Current Opinion in Infectious Diseases. 20 (2): 115. doi:10.1097/QCO.0b013e328014392d. ↑ "Guidance for Industry and FDA – Letter to State Agricultural Directors, State Feed Control Officials, and Food, Feed, and Grain Trade Organizations". Food and Drug Administration. Archived from the original on June 9, 2007. Retrieved August 13, 2007. ↑ Hohn, Thomas M. "Trichothecene-resistant transgenic plants". U.S. Patent 6,646,184. Priority date March 31, 1999. ↑ Dubois E, Hennechart C, Deboosère N, et al. (April 2006). "Intra-laboratory validation of a concentration method adapted for the enumeration of infectious F-specific RNA coliphage, enterovirus, and hepatitis A virus from inoculated leaves of salad vegetables". Int. J. Food Microbiol. 108 (2): 164–71. doi:10.1016/j.ijfoodmicro.2005.11.007. PMID 16387377. ↑ Schmidt, Heather Martin. "Improving the microbilological quality and safety of fresh-cut tomatoes by low dose dlectron beam irradiation – Master thesis" (PDF). Retrieved August 11, 2007. ↑ Oxford English Dictionary (First ed.). London: Oxford University Press. 1933. p. 1557. ↑ Merck's Bulletin, Volume 5, William Henry Porter, 1892. ↑ "Medicine: Potato Salad," Time, August 1, 1932. ↑ "Poisoning Hits 150 in Chicago". Kenosha Evening News. May 27, 1944. ↑ "Food-Related Diseases". US Centers for Disease Control and Prevention. 1 2 3 Greig, Judy D. "Infective Doses and Pathogen Carriage". Public Health Agency of Canada. ↑ Scallan E, Griffin PM, Angulo FJ, Tauxe RV, Hoekstra RM (2011). "Foodborne illness acquired in the United States—unspecified agents". Emerging Infectious Diseases. 17 (1): 16–22. doi:10.3201/eid1701.P21101. PMC 3204615 . PMID 21192849. 1 2 3 Scallan E, Hoekstra RM, Angulo FJ, Tauxe RV, Widdowson MA, Roy SL, et al. (2011). "Foodborne illness acquired in the United States—major pathogens". Emerging Infectious Diseases. 17 (1): 7–15. doi:10.3201/eid1701.P11101. PMC 3375761 . PMID 21192848. 1 2 Sabrina Tavernise (July 26, 2013). "F.D.A. Says Importers Must Audit Food Safety". New York Times. Retrieved July 27, 2013. One in every six Americans becomes ill from eating contaminated food each year, Dr. Margaret A. Hamburg, F.D.A. commissioner, estimated. About 130,000 are hospitalized and 3,000 die. 1 2 Stephanie Strom (January 4, 2013). "F.D.A. Offers Sweeping Rules to Fight Food Contamination". New York Times. Retrieved January 5, 2013. One in six Americans becomes ill from eating contaminated food each year, the government estimates; of those, roughly 130,000 are hospitalized and 3,000 die. ↑ "Report of the French sanitary agencies" (PDF) (in French). INVS/Afssa. ↑ "Summary of Report of the French sanitary agencies" (PDF) (in French). INVS/Afssa. ↑ Kirk, Martyn; et al. "Foodborne illness in Australia: Annual incidence circa 2010 pp7-9". Australia Department of Health. Australian National University. Retrieved 13 September 2015. ↑ "Food borne illness in Australia" (PDF). OzFoodNet. ↑ Astridge, K; McPherson, M; Kirk, M; et al. (2011). "Foodborne disease outbreaks in Australia 2001-2009". Food Australia. 63 (12): 44–50. ↑ "Food Hygiene". BUPA. Retrieved 13 September 2015. ↑ Brian Deer (February 24, 1985). "Food poison deaths probe may reveal NHS flaws". The Sunday Times. ↑ Cowden JM, Ahmed S, Donaghy M, Riley A (2001). "Epidemiological investigation of the Central Scotland outbreak of Escherichia coli O157 infection, November to December 1996" (PDF). Epidemiol. Infect. 126: 335–341. doi:10.1017/S0950268801005520. PMC 2869700 . PMID 11467789. ↑ "The Food Standards Agency: A Force for Change". gov.uk. Food Standards Agency, United Kingdom. January 14, 1998. Retrieved 14 August 2016. ↑ Hardy, Anne (13 January 2016). "Food Poisoning: An On-going Saga". History and Policy. History and Policy. Retrieved 4 July 2016. ↑ "Meat Produced by Advanced Meat/Bone Separation Machinery and Meat Recovery (AMR) Systems". Federal Register. U.S. National Archive and Records Administration. Retrieved 3 July 2016. ↑ "Livestock Industry Opposed to Stricter Laws on Mad Cow Prevention". January 2003. Retrieved 3 July 2016. ↑ "Preliminary FoodNet data on the incidence of infection with pathogens transmitted commonly through food—10 states, 2007". MMWR Morb. Mortal. Wkly. Rep. 57 (14): 366–70. April 2008. PMID 18401330.